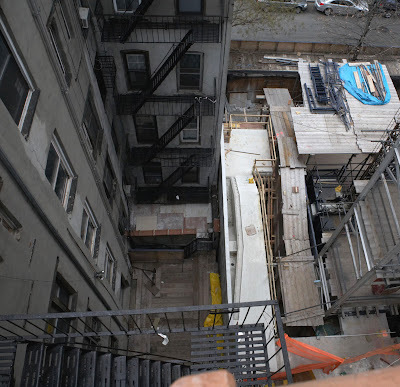 A view of the entire shaft of the building on Bowery and the buildings adjacent that it dwarfs . A view of the hotel and the buildings adjacent to an exterior entertainment area . A view of an exterior space and the adjacent buildings windows . This will be used for dining and drinking ... and what else ? An exterior space sitting cheek-by-jowl with the windows of next-door buildings . This space will be used for dining and drinking ...and what else ? 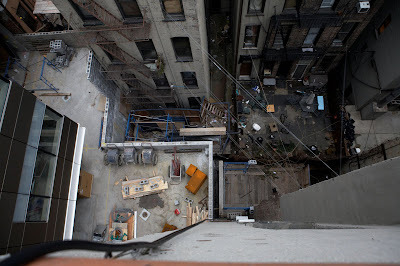 A view of the means of egress required for the fire-escapes for the old existing building next door . 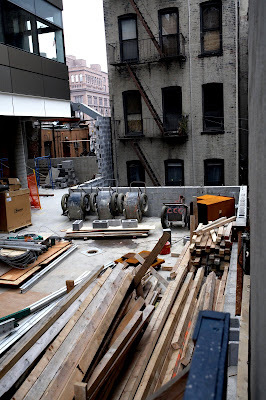 Exterior space that will be used for outdoor dining and drinking ....and what else ? 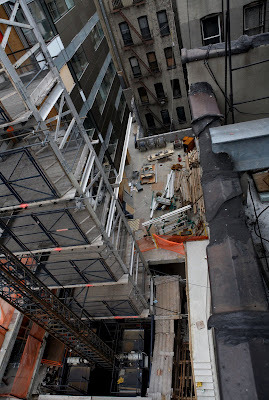 An exposed concrete deck at the penthouse level , right above the next door building . 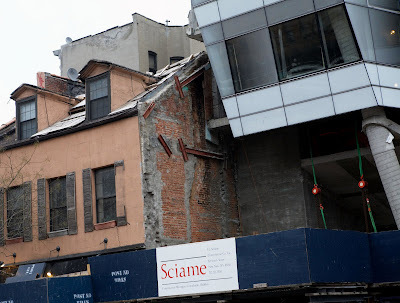 Some structural details where the building meets the adjacent building on Bowery . A look at some custom concrete design . 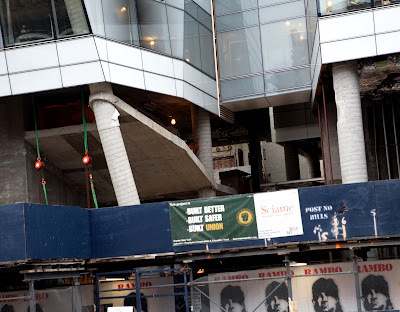 The base of the building on Bowery . We have posted twice previously of this building and the affect it is now having and will have in the future on the surrounding community . Again we state that this building is in our opinion clearly out of context where it stands and should never have been allowed to be built . This monster simply overwhelms and intimidates all that is around it .It dominates ... and brutally so . If architecture is as Mr. Venturi suggests a dialogue between generations then this abomination is just a monster child screaming at the top of its lungs. 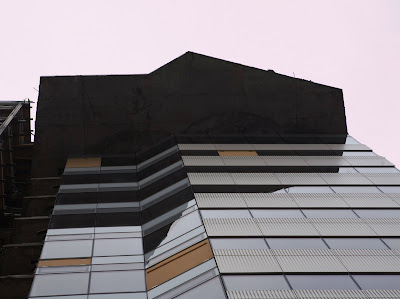 Perhaps in a Jetson-esque future with George , Jane and Astro somewhere in outer space or in a sheikdom on the Persian Gulf this building would be appropriate but not here , not today in the East Village . Perhaps on a west coast beach near some early deconstructed Gehry beach house that some of the building seems to be inspired by this building could be tolerated , but again not here where it is now standing . 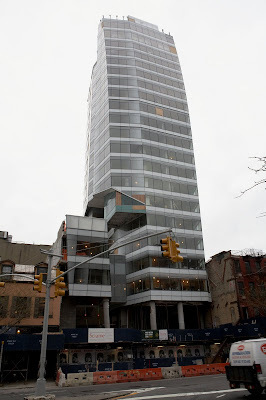 The developers of this building , Moss/Peck , have spent a great deal of money , other peoples money to build this building . It was not an easy building to design and build . 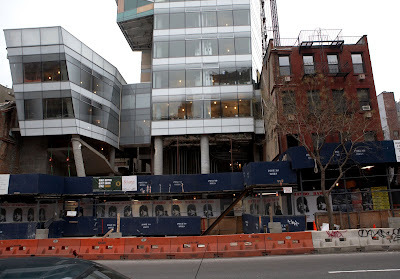 Without computers and sophisticated design algorithms to design the footings , concrete structural frame and the custom Gehry-esque exterior skin this building would likely not have been built. It simply would have been too expensive . All those others that invested their money will want their payback , their profit as soon as possible . The operators of this hotel will have to quickly organize this hotel ,fill it with people and create income and profit in what ever way possible : this hotel will of financial necessity not just be hotel rooms , there will also be other entertainment activities that will almost certainly intrude on the people of the surrounding neighborhood far more than the handful of Hookers and drunks of the old Bowery ever did . Lately most of the complaints from the community have been concerned with this additional entertainment activity that will generate a revenue stream that ,considering the cost of building and operating this building , will be absolutely necessary . We show in the images the areas that will be used for outdoor dining , drinking and what ever else that will , of financial necessity , be associated with the exterior dining and drinking areas . These areas are cheek-by-jowl with the adjoining buildings all around this building . The community has been assured by the developers that there will be no excessively loud or distubing activity . They have assured the neighbors that there will be no hip , upscale club scene that will ever be allowed to develope in any of these exterior spaces .That is , no horde of loud drunken partiers with bodyguards , limos and the concomitant noise and traffic jams on 5th street to intrude on what is a reasonsably quiet and orderly community . 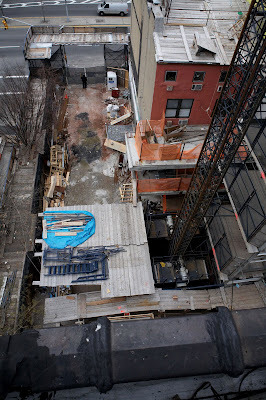 The developers of this hotel have opportunisticaly signed on to a series of stipulations proposed by Community Boards 3 that will supposedly protect the community from a nightmare future that could include a wild club scene established at this hotel . It is claimed by the board that these stipulations will have teeth ... and they will , teeth of freshly risen bread dough : these stipulations limiting the hotel's operations will soon either come to be ignored or in time thier more restrictive limiting obligations simply will be officially forgiven by a future city administration . No beast can bite with such teeth not even our city government ...even if it were really, really inclined to do so .The Bloomberg administration has a very poor record of protecting or in any manner looking to the interests of the East Village community ... when a developers profits are at stake . This is all about money , personal power and glory for those that choose to make wealth by imposing thier personal business plan on some portion of our city . With our current city administration it is as they say "money talks" , that is the top law . After a year vacant 110 Avenue A the former 40 year home of the historic " Sal's Pizza" ( see an NMNL post concerning Sal's using the Blogger search feature ) is again a pizza parlor . 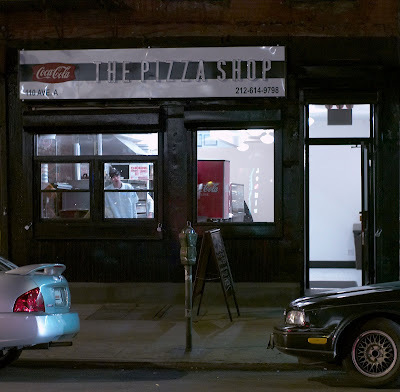 We know little of nothing of the new guys on the block but it is good to see a location that has historically been a pizza parlor again a pizza parlor . Eddie on a summer afternoon under Eddie's tree with friend and neighbor Richard . Eddie with his vision of God and the Cosmos revealed to him after being holed-up in a neighborhood basement for 3 days and nights ( see here at NMNL "Basements , Dreams and Cosmogonies") . 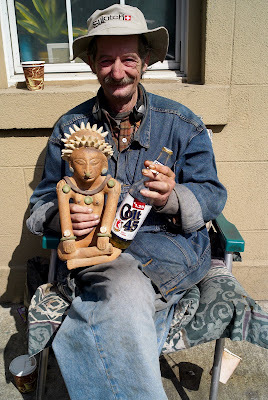 In sunshine on 4th Street with idol , cigarette and malt liquor . Eddie Graham one afternoon in winter sunshine . 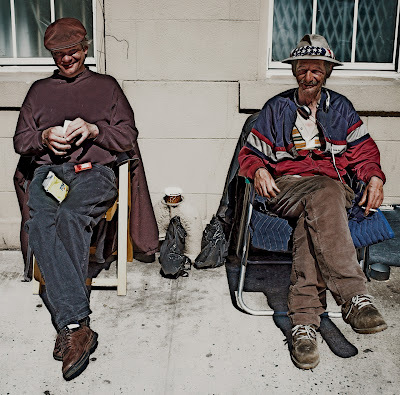 A sunny spring day on 4th St. with good friend Charlie. 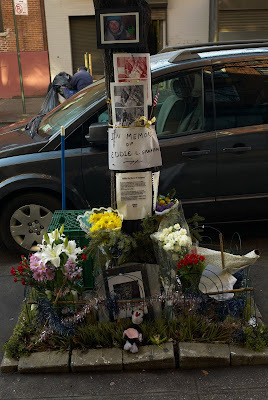 Eddie's memorial at 195 East 4th Street this last week . 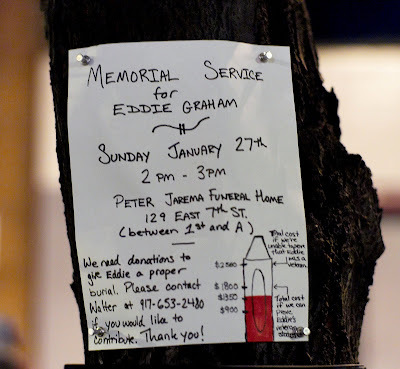 One day Mayor Koch planted a Linden tree at 195 East 4th Street , about 200 ft. from NMNL world headquaters , and Eddie Graham sat beneath that growing , spreading Linden tree in summer , fall , winter and spring for so very many years . 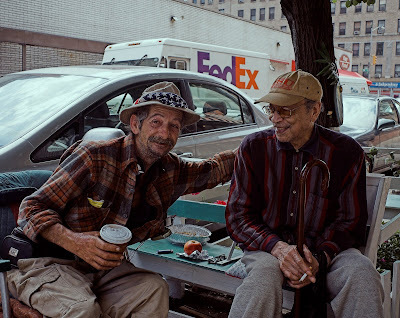 Through those years so many came and went passing Eddie , sometimes not seeing him , sometimes seeing him , sometimes stopping to talk , sometimes offering food and coin to help and sometimes just stopping to hang-out for hours drinking malt liquor ,talking , playing cards and passing time . Eddie was waiting to be old enough to collect his social security check so that he could get a cheap room and live someplace other than on the street . He didn't quite make it to that goal .Sadly , just this month a room was found for Eddie at Heuss House . He died just a bit too early to live in that room . 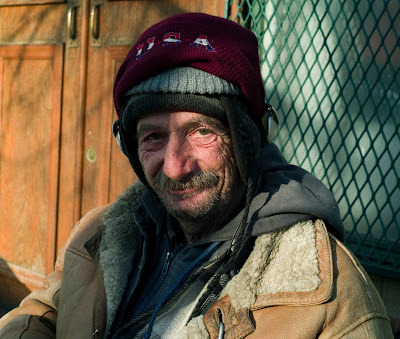 We have been told that Eddie died of the complications of pneumonia ; a condition likely resulting from poor nutrition and extended exposure to the cold .This winter he had been denied by a real estate management company access to a basement that he had been sleeping in for more than 10 years during cold weather . We had learned recently that Eddie was ill and that he had been taken to Bellevue hospital ... then all-of-a-sudden last week Eddie was dead . When warm enough Eddie slept there at 195 East 4th on the street . He kept a neat camp . Everything had its place . At daybreak camp was broken and all was neatly stowed . Sometimes neighbors provided sanitary facilities ,sometimes they were found between parked cars . In cold or other inclemate weather Eddie had until this winter slept in a near-by basement .On cold days neighborhood friends often invited him in to spend time and warm himself . Eddie built a little seating arrangement around his tree . He spent considerable time painting it all .With-in that construction he planted and tended a garden as it grew during the summer months . Later someone destroyed the seating around his Linden tree but the garden lived on . He decorated his little establishment for Halloween ,Christmass , Thanksgiving and his birthday . Sometimes on these days he had a party with friends and strangers passing by . Though just a spot on the sidewalk it was a home . Eddie made it that way . Now all of that is just his memorial on 4th street until the real estate management company in charge of 195 cleans -up and removes it all .. Some claimed he was the Mayor of 4th Street , a title that he cherished . He knew many of the neighborhood children and their parents . He made birthday and Christmass cards for them which they much enjoyed and cherished . 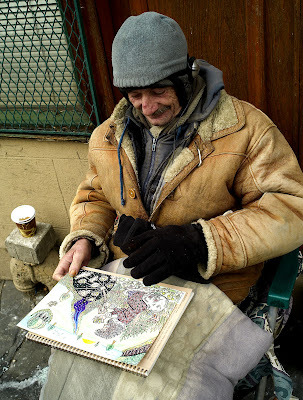 He was a regular daily part of many , many 4th street families and residents lives . He is certainly missed by them all . ABOVE : The window through which the look-out watched Ray in his store . 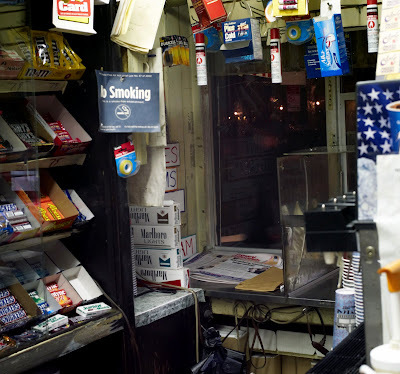 ABOVE : The cash register and cash-box full of cash behind Ray's counter that the young thieves were after . Saturday night shortly before mid-night a gang of young males attempted to rob Ray's Candy Store . Their attempt failed but they did a few minutes later , 75 feet from Ray's at the corner of 7th st. and Avenue A , suceed in attacking a male . The male that was attacked , in his late 20 s , was part of a typical mixed Saturday night group of people out enjoying the East Village night-scene . The man was hit several times but most notably in the eye which was significantly bruised and cut . The gang , which this man claimed included 10 individuals , hit and ran away very quickly . The injured man did not request an ambulance . Police were at the to scene and investigated the incident . 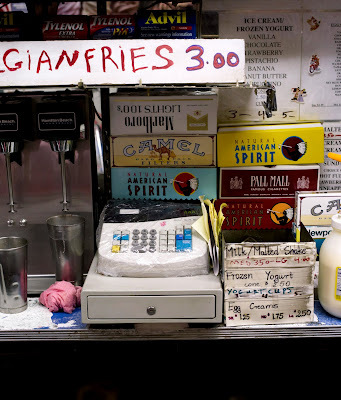 The earlier attempted robbery involved 4 young males , 2 males inside at the counter , 1 male outside at the window of the candy store to watch for Ray who was in the back of his store preparing Belgian Fries and 1 male standing outside as a look-out on the street . The 2 males inside at the counter were preparing to climb over the counter to grab the cash in Ray's change box and cash-register as the male outside at the front window was busy advising them as to whether Ray was still safely in the back of the store . We noticed this operation in progress and thus stepped into the store , backed-up by "Biker Bill" Walker. As we walked in the young punks ran out the door and down the street to join their friends who would a few minutes later attack a man at 7th and avenue A . The members of this racially mixed group of young males appeared to range in age from 14 t0 18 years .They were at least 6 in number . Earlier in the evening they had been seen running and rough-housing among themselves on avenue A . No member of this gang was as far as we know arrested Saturday night .